In 2012, Obsidian Entertainment almost fell apart. The independent game studio had just suffered a major blow—the cancellation of a big-budget role-playing game they were developing with Microsoft—and they were struggling to make ends meet in the midst of an uncertain, transitional gaming industry. Josh Sawyer, one of the company’s public faces and the veteran game designer who directed Fallout: New Vegas, suggested they launch a Kickstarter. With crowdfunding, he argued, they could make the one game they all wanted to make—an isometric fantasy RPG—without having to give up creative control to an outside investor or publisher. On top of that, they could own what they made—no longer would they be shackled to a big corporation’s license, like they were with New Vegas, Alpha Protocol, and all of the other RPGs they’d developed since first forming in 2004. The money gave Obsidian a level of freedom they’d never had before. With Project Eternity, they wouldn’t have to worry about a publisher hacking up their budget, setting unreasonable expectations, or missing milestone payments. People at the studio no longer had to come into work worrying that suddenly their game had been cancelled. They already had the money. 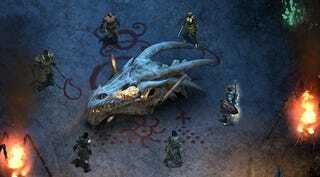 On March 26, 2015, close to three years after Microsoft cancelled Stormlands, Obsidian finally released Pillars of Eternity. It was a huge success both critically and commercially. (We thought it was stellar.) It’s led to a two-part expansion—coming in the near future—and they’re hoping to make sequels, too, maybe with more Kickstarters. Things worked out the first time, after all. We hear—and report—a lot about Kickstarters that over-promise and under-deliver, or those that disappear with fans’ money. Sometimes, though, Kickstarter can save a studio from what seems like inevitable doom. Sometimes crowdfunding can lead to great things.